One of the most exciting things for me about going to new places is the food, and Africa was no exception. On arrival, I knew there were a few things that I had to try such as matooke (steamed green bananas) and the infamous meat stew, so I dove right in. The matooke which turns into a yellowish mash after steaming is definitely an interesting concoction. I think the best representation of matooke is probably a potato with a hint of sweetness. It tastes okay and some ground nut sauce (non-sweetened peanut butter) definitely improves the taste. Next, we have the cow intestine which sounds as bad as it tastes. It doesn’t help that it looks like a huge snail and is chewier than cow tongue. I really didn’t think that could ever happen. The meat stew certainly makes up for the cow intestine. Oh, the meat stew… If I had to choose a last meal to finish off my life, I think the meat stew would be in contention. I really don’t know what makes it so delicious but it’s served with fries and it’s just good. Now, I can’t mention food without mentioning the Rolex. You are probably thinking, “yes, you can mention food without mentioning a watch company” but please let me explain. 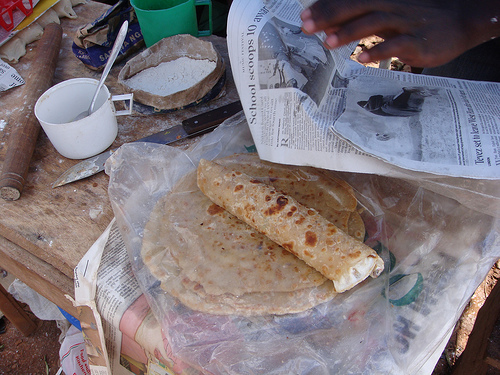 The rolex is the Ugandan equivelent to a breakfast burrito. The best part about it is the chipati which is similar but far better than a tortilla. I can’t really describe it other than unhealthy, but I am excited on bringing a recipe back to the states so I can replicate Africa all of the time. Next, they take the chipati and throw it on a fryer with eggs, onions and some salt. After that, they take some tomatoes and wrap it all together. For $.45, I don’t think I could ask for a better meal. Lastly, we have the pork. Africans love their pork and I can’t blame them one bit. They bbq the pork and serve it on skewers with tomatoes and chili seasoning. My first run in with the pork was at an infamous restaurant called “Deep Blue”. The place is known for its pork and all of my ex-pat friends rave about it. We go to Deep Blue on a Friday night and order up 15 skewers for the entire table. It is quite obvious that it’s taking longer than normal as we close off the first hour being there without any food. Finally, the food arrives and we delve in. Not 5 minutes after we started eating, our ex-pat friend tells the waitress, “This pork is not from here, it’s not Deep Blue quality”. The waitress tries to cover it up but our friend has no intention of backing down. Finally, our friend calls over the manager, and the manager admits that they ran out of pork and purchased the pork down the street at another restaurant. How can I pork place run out of pork? Needless to say, I thought it was excellent regardless of being important, so I can’t wait until we go back for the real deal. That’s mostly it for the food. I could mention the pizza but there’s nothing really to talk about there. It’s not the same. Other than eating food, I’ve started taking tennis lessons. Yeah, it was definitely a random move. I met a guy named Moses at a local African music concert who is an Ugandan Olympic hopeful and gives lessons, so I decided there’s no better time as now. The first lesson was quite eye opening to my need for more lessons but it was really fun and am trying to get them two times a week. That’s all for this week. I have so many more stories but not enough time to share them all. Oh well! Just an average guy with a love for beans. Awesome, thanks for the update Ben! Love that it’s all about food…no way I would do the intestine thing, blech, but let us know how the “real” pork is the next time you hit up Deep Blue! Know that we are keeping you in our prayers – and let us know if there’s anything specifically you would like prayer for! And we can totally play tennis when you get back!